Another Exclusive Item From the S.A. 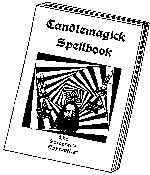 The Candlemagick Spellbook is not available anywhere else. We are an established bookshop and have thousands of books on our shelves but as the scope of publishing changes radically in response to Information Technology rarer magical works are not being reprinted for they are amongst the most costly of books to reproduce being a cross between a textbook and an art book. To provide clients with maximum choice we are therefore running both printed and digital versions of most of our range as you will see from this booklist. If you've never tried downloading S.A. Cyberbooks before then you are in for a wonderful surprise because unlike regular ebooks (which have hardly any formatting or illustrations and are often difficult to read and understand), S.A. Cyberbooks are set out just like the original printed book and are super-clear and easy to use. Just double-click on the file and you're there. (or if you are already viewing on line just click here) An electronic version of this booklist will open up and you can simply click on the live links to see more information. That's just how our Cyberbooks work on any computer. You can read the book any number of times on your computer screen or print out the entire book if you wish, or just the chapter or section you are interested in. And you can upscale the text so you could, for example, print out the script of a ceremony or a chant / spell in large type to make it easier to read during your rite; or if you are hard of sight. (Ideal also for those who may wear glasses but don't want to during a ceremony). You don't even have to draw out the talismans from a grimoire - just print them off when you need them and colour them in! This is particularly useful if the original talismans are in a secret script because then you know you are getting the exact thing the writer of the grimoire meant and will not introduce mistakes through copying which might nullify the magic. If you are transfering sigils from a grimoire onto a wand or knife handle etc., just scale them to the best size, print them out, stick the printed paper onto the wand etc. and engrave around. As you can see there are so many advantages, not the least of which is price because S.A. Cyberbooks enable you to possess rare manuscripts for peanuts which would otherwise cost an arm and a leg. And of course, you can access a whole world of genuine occult teachings in an instant. Even a large grimoire with many illustrations will only take a few minutes to download to your computer. You can do it 24/7, when it is convenient to you - no waiting - and you don't have to pay exhorbitant shipping costs so ideal for overseas clients. You get the crucial magical techniques just when YOU want them. An important consideration if you have a pressing problem to fix. Remember that all S.A. Cyberbooks have been edited and formatted by Marabas so are absolutely trustworthy. Unlike many ebooks we have seen offered on the net which have been wrongly paginated, with drawings so small they are impossible to use, and even with incorrect words substituted in the text by conversion programs which weren't meant to handle esoteric terminology. Such ebooks are not worth a light however cheap they may at first appear and with S.A. Cyberbooks users have an email link with Marabas to clarify anything they don't understand. A facility often worth its' weight in gold which nobody else can match. If you really must use your Kindle or other palm-type ebook reader, then you can convert any of our S.A. Cyberbooks to fit your kindle anyway - and you'll still have the original file for use when you are at your main computer. Lastly, keep in mind that at the S.A. we offer you a cast-iron lifetime guarantee. We will replace any S.A. Cyberbook for you if you accidentally erase it, or your computer goes on the blink (though we would expect you to keep back-up copies normally). Try it once and you may never want for a printed book again. The Candlemagick Spellbook contains a selection of very powerful and original spells by Frater Marabas and gives the magical keys that adepts use to MAKE THEIR CANDLEMAGIC WORK. Marabas's no-nonsense, direct and clear style of teaching is familiar to all who have collected his famous Occult Exercises & Practices. In this same initiated manner Marabas here presents secret & original information on "How To Work Spells designed to obtain Anything Your Heart Desires Using Time-Tested Candle Magick methods. THE PHILOSOPHY AND PRACTICE OF HOW MAGICK WORKS - even how to correct some previous failures. HOW TO CHOOSE SYMBOLISM AND PARAPHERNALIA for ANY rite for ANY purpose. HOW TO REPLACE EXOTIC, DIFFICULT TO GET ITEMS WITH READILY AVAILABLE CONSUMABLES THAT WORK. HOW ADEPTS BORROW POWERS FROM THE GODS TO MAKE THEIR MAGIC CERTAIN. HOW TO CHARGE MAGICAL CANDLES - even how to make them yourself if you want to go that far. HOW TO TURN ANY ROOM INTO A TEMPORARY TEMPLE etc. etc. etc. The Candlemagick Spellbook shows practitioners how to work REAL spells for LOVE, LUCK, WEALTH, PROTECTION, PSYCHIC DEVELOPMENT & MORE Now in its 11th year of publication this famous grimoire of candlemagick is fully tried and tested. It has assisted many satisfied clients to achieve the successes they wanted... as you will see from the genuine unsolicited testimonials which pepper this page. We believe The Candlemagick Spellbook is a veritable KEY TO MAGIC! Marabas reveals the SECRET MAGICAL FORMULAE which all experienced ritual magicians use in their work. Why do the authors of widely advertised works on candlemagick never include this type of information which is the foundation-stone of all successful magic? Instead some use a foul trick to protect their interests. They inject into every rite at least one ingredient in each spell which is difficult or impossible to attain so the budding magician or witch doesn't stand a chance. Marabas includes in his spells only those ingredients which are necessary and ALL are easily obtainable from legitimate occult suppliers. IF YOU FIND ANYTHING IN HIS SPELLS WHICH IS UNOBTAINABLE WE GUARANTEE TO REFUND THE PURCHASE PRICE OF THE BOOK FORTHWITH AND WITHOUT QUESTION. Marabas says; 'Don't worry if you've tried candlemagic before and didn't get what you wanted. REAL CANDLEMAGICK DOES WORK IF YOU KNOW HOW TO APPLY IT; and we are sure that there is no more straightforward way of learning the methods than the Spells and ceremonies given in Marabas's Candlemagick Spellbook. After giving you the keys to GENUINE ritual magic Marabas goes on to explain his unique MASTER RITUAL. Coupled with the quick-reference data in the back of the book the Master Ritual forms an astounding step-by-step framework WHICH EVEN THE RAW BEGINNER CAN USE TO SELECT AND DESIGN THEIR OWN RITUALS FOR THEIR VERY OWN SPECIFIC PURPOSES. Naturally, for those people who want to begin spellcasting right-away Marabas also includes THE FULL TEXTS, OF EIGHT POWERFUL RITUALS TO AID THE PRACTITIONER. (INCLUDING LISTS OF INGREDIENTS, WHAT TO SAY, HOW AND WHEN TO SAY IT ALONG WITH CLEAR DIAGRAMS OF EACH ALTAR LAYOUT) Marabas has also included simple ceremonies which are designed develop the newcomer's psychic nature and adds to this instructions on preparing and consecrating your magical equipment. Thus the practitioner can develop his/her abilities as a witch/magician and increase the effect of his/her candlemagick, learning how to apply it creatively to other purposes after succeeding with their first experiments. Exclusively available from The Sorcerer's Apprentice© the unique Candlemagick Spellbook is not sold new through any other source. It was written by Frater Marabas specifically for loyal customers like yourself and many customers swear it has improved their lives. "Frater Marabas's Candlemagick Spellbook has helped change my life, please give him my special thanks for having introduced me to candle magick." Rick M, Lincoln. "Thank you very much for The Candlemagick Spellbook . It is definitely the best book I have ever read on the subject." Andrew S. Taunton. I have read The Candlemagick Spellbook and was most impressed having bought dozens of books from other companies - yours was the most impressive. " Leonard K, New York. "Please could you thank Marabas for writing The Candlemagick Spellbook it is fantastic, he introduces the reader to this type of magick in a clear, concise manner, never before have I read a book with so much understanding and clarity. He truly is a marvellous magician" Richard D, Doncaster. These genuine unsolicited testimonials are used for illustration purposes only - the originals are held for inspection at our HQ, in Leeds, Yorkshire. U.K. Other users may not have enjoyed the same level of effects. Once you have read The CandleMagick Spellbook and gained experience with the Ready To Go Spells you can easily develop your own using the MASTER RITUAL. Do NOT confuse the expert rituals in The Candlemagick Spellbook with the half-baked 'prayers' widely advertised elsewhere. Marabas reveals original and powerful rituals based on ancient magical traditions, not re-hashed folk-legend lifted third-hand from unreliable sources. The Candlemagick Spellbook gives you the Key to genuinely successful rites AND rapidly teaches you the initiated techniques of casting spells. You simply won't believe this knowledge is so simple until you see it. "Earlier this year I purchased Marabas's Candlemagick Spellbook. Although I have experience with candlemagic I could not believe the level of success I achieved with my adaptaton of your spells. From living in rented accommodation and having inumerable debts I now have a half share of a large house and a one acre plot in Surrey plus savings. I also have a brand new car and am looking forward to my first decent holiday in three years". Mrs D J. Richmond. "Hi Just writing to let you know that I've had (I will not say unbelievable since I'm definitely a believer now) great success with your Candle Magick Spell Book. In particular the rite to Fortuna which has brought me not only the studio flat that I desparately needed, but I am now �59,697.72 richer because of the rite as well! I'm now in the process of doing up my temple in my new flat with a special place reserved for the Goddess Fortuna on her festival day to thank her. And I'm writing this letter to thank you guys for making it all possible. P.S. I've currently been training my self up to adept rank for the past four years thanks to Marabas's teachings. but was put on hold until I had a permanent home. I'm back in the fray now - look out astral, here I come! " These are GENUINE testimonials, the originals of which are available for checking at our Leeds HQ. The people who write these glowing reports are totally independent (not relatives, not friends, not employees) they have no vested interest in writing to us. They write spontaneously to share their good news with you. We didn't ask for them to write, we don't pay them or give them a discount or in any other way reward them for their stories. Their experiences are GENUINE and it could just as easily happen to you though we can't of course guarantee it. The Most Successful Candle Magick Operations Of All Time? HOW MAGICK WORKS and how to correct previous failures. HOW TO SELECT OR SUBSTITUTE EXOTIC INGREDIENTS with consumables that work. Learn Why & How they are used. and make your magick certain. HOW TO TURN ANY ROOM INTO A TEMPORARY TEMPLE etc. etc. Where else could you buy a book and then be able to telephone the author direct for further advice and help? Mrs S. from York says she changed her life simply by using the spellcasting keys included in The Candlemagick Spellbook , you see, Marabas's book is more complete and easier to understand than any candlemagick book ever - we guarantee it. But if you do need advice it's comforting to know that we're just a telephone call away. Even if you live far away in another country you can always reach us within seconds with an email. We never leave customers to fend for themselves so there should be no bar at all to YOUR Hearts' desire. Download your copy right now and you could actually be applying the magic this evening! (see below). Save pounds and be working a spell within minutes! Click on the cyberbook buy-now buttons below to pay with your card and you can download this amazing book straightaway (takes a couple of minutes to download), then just click on the file to open up and print out or read at your leisure- and save pounds over the printed version. The Price is just £9.95. Ideal for overseas clients - you don't have to pay extra for airmail and no waiting for delivery - you can be reading it in minutes. Cyberbooks are also useful for UK residents in a rush or on a limited budget. Download guaranteed successful and virus free. Download right now in the background whilst you surf OR use the link given when you buy which is active for 24 hours for you to download at your leisure. Even if your dog pulls the power cord on your laptop - just use the link in the email we send you again as many times as you like. We guarantee you a good working file - even if you later accidentally erase it we will replace. You can't lose. [because digitised downloadable goods are dealt with differently they are stored in a separate basket - you can add to either your physical basket or your digital basket at any time but please remember to check-out each basket separately when you go to pay.] . We are constrained by atheists to state: This literature is provided for research, historical, worship and entertainment purposes only. Not an invitation to change one's religion or world view. Folk-history, lore and legend may not be a reliable guide. In this context 'secret' means 'known only to a very few'. References to magical force, the aura, and energies are considered speculative by science. Application Suggestions given for illustration purposes only: You may need ancillary items to complete some application suggestions. All experiments are not guaranteed and are undertaken at user's own risk. May require willpower, aptitude and the development of skill. This is a genuine offer - trust us.